Welcome to Cowley Road Methodist Church! We are situated in the heart of East Oxford, on the corner of Jeune Street and Cowley Road. The linked black and white hands of our logo represent our multi-racial congregation, and the diversity of our local community. The church's mission is to bring the love of God to all. We seek to be accepting and welcoming of everyone, regardless of background or theology. 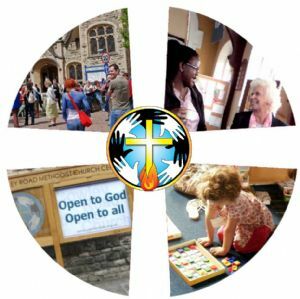 Come along and be part of an inclusive Christian community. Good Friday - Readings and prayers at 10.15 am. East Oxford Walk of Witness starts 10.30 am on the church forecourt. Toddler Group is now closed for the Easter holidays. It starts again on Monday 13 May at 9.30 am. Coffee, Cake and Company - Saturday 25 May, 10 am - 12 noon. Everyone welcome. We are looking for pianists to join the rota to play at Sunday morning worship.